Knowing the best times and situations to bluff is extremely important to maximising your expected value from them. 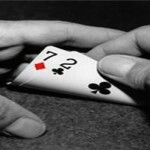 Skill and timing will only increase through practice, however here are some well-known situations where bluffing is definately profitable in poker. A player’s position at the table is very important when deciding to bluff. The player sat in late position has the most information on the game (because he’s seen everyone’s acted before him), giving him a crucial advantage in both pre-flop and post-flop play. It allows him to make pot-steals or blind steals to great effect when he spots weakness/tightness at the table. For example, if no one has opened the betting in a six-handed game, it’s very common for the player in late position to “steal the blinds” holding nothing but junk with a 3xBB raise. Importantly, this only works on tight tables – and you should limit doing this with loose-agressive players in SB/BB. Short stack players (i.e. less than 30xBBs) play a very tight game in cash games. This means they only enter pots with premium hands and fold alot to large-size bets post-flop. The combination of fold equity against these players, and their tight calling-range, means bluffing in heads up situations with these players is very profitable and likely to succeed. Scare cards are one’s dealt on the turn or river which can complete potential draws such as a flush or straight. They provide solid opportunities to bluff a weak off a marginal hand in poker, especially if you can convince him that you just completed a draw. Other scare cards can include overcards (for example, an Ace on river allows you to force a tight opponent with a small pair off the hand). Missed a Draw on the RiverIf you missed a draw on the river, but you have reason to believe your opponent was also on a draw and missed, it’s a great opportunity to steal the pot. Very often in No Limit Holdem even if a player is on a draw and misses – even if he knows you’re on a draw – he won’t be able to call a re-raise because of negative pot-odds. This is also why table position is so important to bluffing, and why it provides a great opportunity to bluff when you’re the first to act on a weak table. If you can read your opponent i.e. he is predictable or new, he is very unlikely to be check-raising you. In these circumstances, if your opponent has checked repeatedly, it’s likely a sign of legitimate weakness. A half-pot sized bet on the flop (or 2/3 – 3/4 pot-size bet on the turn and river) is the right amount to force a tight player to fold. MTTs & Heads Up Poker GamesMTTs (multi-table tournaments) and Heads Up matches require you to bluff and play far more agressively. Especially in tournaments, agressive movies such as stealing, re-stealing, squeeze play and value shoves are far more common and need to be utilised. In Heads Up matches you should pretty much be bluffing every single hand, raising pre-flop on the button, and be cbetting every flop from position (half-pot sized bet).